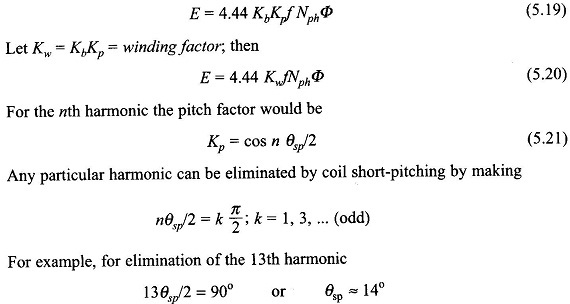 The meaning of the pitch factor can be arrived at from another angle. In Fig. 5.20(a) with positive direction of coil-side emfs marked in opposite direction, the coil emf is the phasor sum of coil-side emfs, i.e. as shown in Fig. 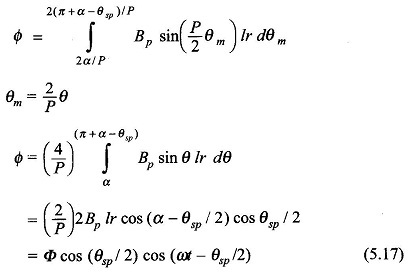 5.20(b). Thus short-pitching helps in elimination of any particular harmonic or in reduction of the harmonic content of the induced voltage in general. It is easily seen from Fig. 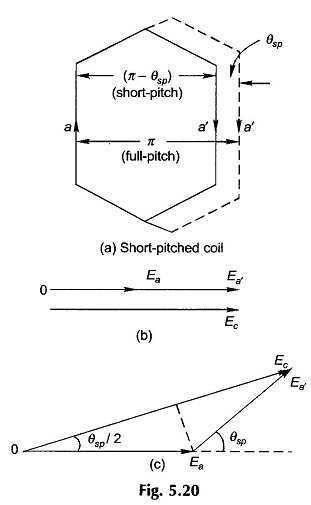 5.20 that short-pitched coils have shorter end connections. Thus there is a saving in copper per coil but part of this saving is wiped off by the fact that more series coils/ phase would now be needed to generate a specified phase voltage. A designer has to weigh these factors in arriving at a decision on the angle of short-pitching.